Alexander Ovechkin worries that if the Washington Capitals don't make the playoffs and he still scores 60 goals, fans will look at him as a selfish player. "Maybe some people will think; 'Oh, he's selfish, he just wants to score goals, he doesn't want to win,' " Ovechkin said Wednesday during a conference call set up by the NHL Public Relations department. "I don't want to look selfish." His concerns, though, haven't stopped him from shooting – a lot. After Wednesday's win against Buffalo, he has 359 shots, tops in the League and 69 more than Olli Jokinen and Henrik Zetterberg, who are tied for second. Ovechkin is no stranger to shooting. Last season, he led the League with 392 shots. His rookie season, 2005-06, he fired off a career-high 425 to lead the League. Of course, Ovechkin also has scored a League-best 152 goals since the lockout. "If you don't shoot, you never score a goal," Ovechkin deadpanned. "If I have a chance to shoot, I'm always shooting." This doesn't mean Ovechkin is selfish, however. It just means Ovechkin is being Ovechkin, which is critical, because if he were to change his style or alter his personality, chances are the Capitals would plummet out of the Eastern Conference playoff race faster than a boulder falling from a cliff. Ovechkin's chase of 60 goals this season, a feat that hasn't been accomplished in 12 years, likely means Washington will remain in the playoff hunt the rest of the way. Ovechkin scored twice Wednesday -- he now has 54 goals -- in a 3-1 win that moved the club within two points of a playoff spot. "It's all in my mind to help the team win because we have a situation where we can push forward and go forward," Ovechkin said. "If I score a goal and we win, I will be happy. But, you know, right now it's all about winning. If I score 60 and we go to playoffs, I will be very happy." Selfish isn't an adjective associated with Ovechkin at all. His seven-game goal drought from Feb. 15 until he finally snapped out of it this past Saturday is a perfect example. Even though he was stuck on 48 goals for half a month, Ovechkin still dished out five assists, including three against Carolina in a 6-3 loss on Feb. 23. He also has three assists to go along with four goals in the last two games, and has 38 assists for the season. As a result, Ovechkin leads his countryman, Pittsburgh center Evgeni Malkin, by three points in the race for the Art Ross Trophy. The two will face each other Sunday in the NHL on NBC Game of the Week (12:30 p.m. ET). No Russian ever has won the NHL's scoring crown, but Ovechkin wants to be the first, especially if it means making the playoffs, too. "I have a great chance to win the scoring (title)," Ovechkin said. "It's nice, you know. Scoring goals for forwards is a big goal. When I score goals, I'm really happy, and when we win the game, I'm really happy, too." If it weren't for that seven-game goal drought, Ovechkin would have a cushion in the scoring race. But through the last two weeks in February, he found himself squeezing his stick a little too tight. Ovechkin admitted to being nervous at times. He sought advice from Caps coach Bruce Boudreau, as well as his own family about what was going wrong. "I was looking at everything because the players who love to score goals, whose job it is to score goals, they just try to figure out what is going on," Ovechkin said. "I talked to Bruce and talked to my family, and they told me, 'Hey, don't worry about it. Just keep going. Keep the play simple. The goals are coming.' 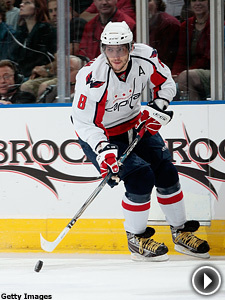 "
Ovechkin broke his silence with a first-period goal in a 3-2 loss to Toronto this past Saturday. Then on Monday, he erupted for three in the first period against Boston, a natural hat trick. The Caps won, 10-2, sneaking closer to that elusive playoff berth. "Yeah, I was pretty shocked," said Ovechkin, who has three hat tricks this season, including a pair of four-goal games. "I think the whole team was pretty shocked. That night, everything went into the net." If it keeps happening, the hockey world finally may get to see Ovechkin on the big stage – the Stanley Cup Playoffs. Then, they'll see firsthand this is not a selfish player. Superb is a better fit.